Sure, designing a pool and maintaining it doesn’t sound hard at all. However, is creating one really what you want? A lot of individuals and new house owners are ready to move into a house with a pool in it, or build one in their existing homes. This is probably due to the fact that pools tend to give the whole house a more expensive/ grandeur vibe than most houses without one. Perhaps a vacation away from work by the island pool has had you convinced. If you’ve seriously considered a pool for your house, or even a location you own (such as a hotel), you need to familiarize yourself with a couple of things, and take a few baby steps before actually proceeding towards the actual design of the pool. Of course not any one designer will do the same job. However, there are fundamental, universal principles that are followed religiously in the world of design, including balance and proportion. However, before you get into any of that, you must have a clear idea as to what you envisioned the first time your brain had a eureka moment. Do you want a vinyl-lined, fiberglass or custom concrete in ground pool? Not sure yet? Consult a professional who can walk through you through your options. Now that you’ve decided that you want a pool, let’s talk about design. You may think you know all about design, and that envisioning the perfect picture is all you need. However, many professional pool designers throughout Melbourne would beg to differ. Leave the work to the professionals, guys. You wouldn’t take medical advice from someone with limited credentials, would you? That logic applies here as well. Whilst some designing companies and brands may charge you a pretty penny, it most definitely is worth the cost. Good designers are able to give you their opinion and allow you to speak your mind. Better designers can comprehend what their client wants and tries to work with that vision throughout the project, keeping the dream alive. As cliché as it might sound, designers have their own biases, often wanting their vision to dominate-a trait that you must be warned about prior to sealing any deals. This is where the real questions need answers. A designer will think of water features and management, something, again, which a designer would think of on spot. Does your pool have a stream opening into it? Would you have to speak over the loud gushing of water to talk to your guests? In addition to this, the overall structural design, and hydraulics is essential in creating the pool that is right for you. Knowing the scale, material and the space with which you are working with is key in formulating the most appropriate design for you. Often professional swimming pool installation Melbourne might be the best option for you and your family. Take your time when deciding to make this investment. It’s a big one! Are you looking for a shower repair and installation services in Melbourne? Then consider yourself fortunate! Because we provide a variety of shower repair and installation services. Do you want to install a new shower or you simply need to have parts repaired or replaced? The Melbourne shower repairs experts can get the job done without consuming much time. Our professional technicians specialize on different types of shower installations and repairs services. Call us today and you’ll be excited because of how appealing we can make your bathroom look and feel! Furthermore, bathrooms are no longer what they’re known for. In our modern day, they feature a wide variety of showers and its accessories. With all these available options, you have no doubt of having a boring worn out showers. We’ll provide you with multiple samples that are available which will enable when you decide what suits you best, and after that we’ll proceed to deliver a top quality service on either repair or installation. When we decide to install a new shower in your home, we do not just only install to enhance your bathroom appearance, rather we strive to provide an excellent service that would to make your showering experience memorable. Our team of committed, qualified and professional shower repair and installation services would deliver exactly what you want. Our main priority is to make sure that you have a perfect shower that you’d always dreamed of. However, we’ve gained past knowledge and experience because we’ve been in this industry for a long time. Based on this, we know how to combine the best equipment and expertise to deliver the best services. By working with us, we assure you of getting a long-term solutions for your shower problems. ARE YOU TIRED OF INCESSANT REPAIRS OF YOUR SHOWER? Have you been constantly repairing your shower? However, the chances that you’d failed to recognize is that it’s just a matter of time and your system will entirely shut down! The repairs could be either leaking, clogging, short-circuit or that your system does not regulate well. While some of the repairs may look practically easy, appropriate repairs is what matters most. We will help you spot-out the main cause of the problem with the help of our past professional years of experience in the industry. Also, before we begin the repair, we will take time to analyze the situation and as well give you the appropriate cost. If the condition approves a repair, then we go ahead and fix, but, if we realize that the cost of repair is more than the original cost of fixing the shower, then we’ll recommend installing a new shower all together. • 100% guarantee on all work performed. Lastly, if you cannot stand the thought of putting your family through a day without the bathroom, then contact the hot water service Eltham. Our friendly and professional technicians are always available to help you and we guarantee a professional service at an affordable rate. When you need a locksmith, you need them in a hurry. For immediate solutions to any locksmith problems, call us. We are your local, 24-hour locksmith offering a full-service solution to all and any of your locksmith requirements. Do not wait until it is an emergency and you are desperately trying to think, “Where can I find a locksmith near me?” Save our number now and we will gladly be at your service. With our many years of service in the industry, we are the local locksmith of choice and there is nothing we can’t help you with. You never know when you are going to need a locksmith and it always happens when you least expect it. It is never a good time but always seems to happen at the worst possible time. Keys break, keys go missing, get stolen, locked in the house or simply just stop working. We are a full-service mobile locksmith and can happily help you out when you are in need of an emergency locksmith. We will get you problem sorted out quickly and efficiently whether it is your car, your home or your business. Our friendly staff are qualified, accredited, well trained and highly experienced in all aspects of locks, keys and related security issues. We are also fully licensed and insured so you can have peace of mind that the job will be done well and done well. Call us anytime, day or night for any locksmith requirements. We offer a full range of services from key cutting to car locksmith services as well as home and locksmith Melbourne. We undertake maintenance work, security upgrades, new installations as well as lock replacements. We use only top quality brands and materials and our team know what they are doing to give you a top quality locksmith solution at a fair price. Our focus is to add value to your property and give you and your family peace of mind. We are 24-hour emergency locksmith with fast, friendly and dependable service. We have the experience to solve your problems quickly so you can be safe and secure again. Our team are quipped with not only the skills and know-how but also the very latest, advanced equipment and tools to ensure we can tackle any job perfectly. We also have sufficient experienced locksmiths available and on call at all times so when we say we will be there, we get there. We take great pride in out fast turnaround time and quality of service. Customer satisfaction is of the utmost importance to us. We work according to an established code of ethics and code of conduct. No job is too small and no job is too difficult for our team of super locksmiths. When you call us, you know the job is going to be done 100 percent to your satisfaction in super fast time and at a highly competitive price, day or night. Our mobile locksmith team are at your service 24/7/365 so you will never be stuck in a frustrating situation when you are experiencing difficulty with any locksmith related situation. For prompt, reliable service, save our details for when you are stuck, or, call us now. We are here to help. For added security and as per good practice, we will require proof that you are the rightful owner or authorised person to gain access to the property. No one wants to be locked out of their home or their car and no one wants to feel unsafe with a faulty lock. So not take any chances with your safety and make sure you have a quality lock that is professionally fitted for your safety and that of your family. 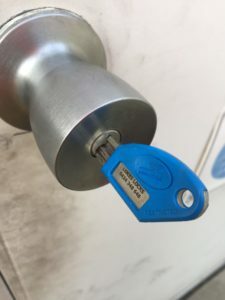 If you have had your keys stolen or compromised in any way, we can do a full lock replacement for your home or business. Many older locks need to be replaced as they are not up to current security standards and are easily opened by criminals with even limited skills. Call us to come and do a full security assessment of your premises, be it your home or commercial premises. We will do a full evaluation of any weakness or areas that could be improved or made to be more secure. Once we have done this, we will provide you with a very competitive, obligation free quotation. You can not put a price on security so don’t settle for less than the very best. Call us now and we will be there in a flash to fix your locksmith problems. For all your home, commercial or automotive locksmith retirements, give us a call for professional service that is fast and of the highest quality. Do not compromise on your security needs. Call your leading, local, 24 hours locksmiths. When facing a locksmith emergency call the most reliable and responsive local locksmith service provider. When it comes to shifting into a new home, then a lot of thing need to be taken care of. it can be an exciting, exhaustive, and sometimes scary process for not only the new first timer, or for the well-seasoned owner who’s moved more than a few times in their lives. The landscape and garden design of the property deserve the same amount of attention as the house itself because it’s not only a matter of pride but also with an attractive and well-kept garden one can make a good impression in the society. But making a good piece of garden in the new house from the beginning is a bit daunting task. Thus, below are some basic designing tips using which you can easily organisation your garden. New homeowners simply need to live in their homes for several months before they actually start making the shifting. In the meantime, one can trim the hedges, Mow the lawn, plant some containers. However, it is good not to add plant material, remove beds, construct living spaces, create paths until you know that you are going to use the house. You will start to notice that some things about your new landscape and garden require your attention above others. It maybe is like prevailing winds from the north are cooling your home more than enough in the winter, and you could use a windbreak to help. Maybe you need some shade somewhere on your property where your family likes to play the most. You will eventually learn about where the most used pathways exist around your property, where established areas for certain jobs are naturally occurring. The best way to approach towards setting landscape design ideas into your action with landscape changes rotates around one simple thing, and that is how much money you have to spend on your projects? 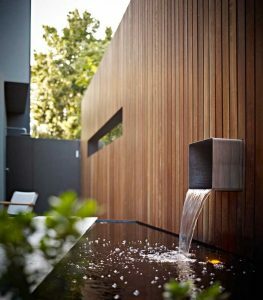 If you have the money, you could hire a landscape designer Melbourne architect who you will work with to establish all your needs at once, and then hire a landscaping firm help to get it done. But, if you’re looking for a pocket-friendly alternative, then you need to consider about which projects should come first, and if you should go Do-It-Yourself or not. One common mistake a lot of new homeowners have is they underestimate how much money landscaping actually costs, so projects often go partially unfinished. Be sure to do a lot of research before you buy anything and take on only what you can comfortably afford. Before you buy one brick or toss your spade into the lawn, make sure you have an established plan, written down and drawn out, step by step so that you have a beginning and a goal in mind for one particular project. If you’re using hardscape materials, make sure you calculate how much you’ll need accurately. If you require help, you can contact with a landscape architect or professional company that provides the material you’ll want to use, and they can help guide you through an estimation process so that you don’t have to buy a lot of things or too little of a product. Make sure you have all the essential tools needed to install the product correctly. Whether you are laying the foundation for a new patio yourself or letting your garden ideas become a reality or even living through weeks of continuous noise from bobcats or jackhammers and, you’re about to do a lot of task for your new house. Set aside plenty of time to get your job done, or simply do whatever you can do in the time you have and don’t stress about it. Sometimes things go well during installation of a project, and sometimes they don’t. Expect blisters, maybe a twisted ankle, dirty nails and clothes, and maybe even sunburn if you’re installing yourself. Your hard work is starting to make your new home look and feel like your own. Invite your friends and family at your place to enjoy, and post lots of photos on your favourite social media site. The use of concrete surface as your favourite decorative surface has led to the extensive use of concrete grinders. With the help of concrete grinding you can get a very refined and perfect finish on the floor. Nowadays concrete grinding is the most popular method to provide finishing to your floor. As far as concrete grinding in Australia is concerned there are number of companies which manufacture concrete grinders. You will find all types of polishing for your floor ranging from mechanical polish to epoxy floor coating. There is also a grind and seal polish that can be used for indoors as well as outdoors. Concrete chainsaw is a very useful power machine which is used to cut concrete, brick, pipe and stone. A concrete chainsaw looks similar to regular chainsaw but it has some different features which makes it capable of tearing through concrete surfaces. This machine contains diamond grit which gives it durability and strength which is required to cut through hard surfaces. This concrete chainsaw has lubrication on it chain which is given by water which helps to get rid of friction. It also helps to keep away the dust while you are cutting. It also saves you from inhaling the dust inside your lungs. Concrete saw Melbourne is a fantastic tool which is used by people of the construction industry. This chainsaw is used to cut holes in the concrete and is also effective for pile cutting. These machines are also used by fire departments to enter a building in case of emergency. These power machines are capable of cutting very hard surfaces which is due to the high quality of material used in making these machines. While using a concrete chainsaw & concrete polishing pads you need to take safety measures. Concrete coring is considered to be one of the most popular forms of concrete cutting today. It can be performed both in the horizontal and vertical direction. You can do concrete coring on the wall, slabs and through the concrete surface using core drill bits. Concrete coring is suitable for both indoor and outdoor projects and you need to cut in circular motion at certain diameter. The best thing is that there are no fumes and dust on this machine and it does not make any noise. The main reason of core drilling is to give a solution to cut accurate circular holes. These holes are required for electrical, plumbing and mechanical purposes. The best part of drilling in certain parts of Australia is that even if there is no electricity then you can use the hydraulic to use the equipment. Sawing is usually used to cut flat surfaces like bridge, floors and pavements. The saw machine is usually taken by a driver. However if you want to get result you should maintain the tools on a regular basis. All the drilling and sawing services have their own vehicles due to which they can reach a place with in no time. You can enjoy your drilling and cutting experience at concrete saw Melbourne. The insulation of pipe is done to maintain the temperature inside the line. The pipes which are insulated can be vertical as well as horizontal. In order to avoid sweating over the surfaces you need to have proper insulation. Once you are done with insulation you can maintain proper temperature with minimum loss of heat. As far as insulation is concerned Polyurethane foam is considered to be much better than other insulating materials available in the market. You can also do cladding over the pipeline which can be done by using aluminium, GI pre coated and SS. In order to enhance the durability of insulation metal cladding is done. Pipe laggers are used to overcome lagging in pipes both in domestic and commercial locations. Pipe insulation has many benefits and it serves you for good number of years. In areas like garages, parks and under floors pipes are left in the open and are hit directly by dirt and snow in the cold weather. Lagging the pipe can help to prevent the outburst of the pipe. The best part of insulating your pipes is that you will end-up paying lesser amount of heating bills. You can reduce your bills up to 2%. Sound lagging also plays a vital role in saving heat. This is the most common type of pipe lagging used in many parts of the world. The material of insulation is made of Polyethylene and is made indifferent sizes to get fit in every pipe. This insulation is helpful to regain the loss of heat from the pipes. This method is mainly beneficial for areas like lofts and under floors. This method of lagging requires the sealing of joints between sections by using a foil tape. The best thing about this insulation is that it not only looks good but it also helps to avoid loss of heat from the pipe. This method of lagging is highly recommended for garages. Fyrewrap installation is one of the most preferred methods to provide insulation. The best part of using Firewrap is that it has undergone testing in order to ensure that it meets the benchmark as far as health and its impact on environment is concerned. Similarly sound insulation is a great option to maintain heat within the pipe and eventually save you energy. In order to provide sound insulation inside the house acoustic and sound proofing materials are used. The best part of sound insulation is that it not only conserves the energy but also helps to make the place sound proof. You can also use foam or fibre glass insulation which will make the outside noise tolerable for you. You can also fill the walls with rolls of cellulose or fibreglass or you can also use to fill the cavities in the wall. You must be aware that insulation of home requires you to spend some amount of money. However the good news is that if you are not able to afford insulation of your house on your own you can take help from the government. Diamond Valley, Australia – Jan. 17, 2016 – The Diamond Valley emergency plumber services provided by Precision Plumbing & Earthworks are available 24/7, at night, on weekends and during holidays when even a minor problem can ruin festivities and result in a disaster. Prompt and courteous service, combined with 100 percent fixed pricing that contains no hidden fees has earned the company a premiere reputation. “Clogged drains and broken pipes are immediate needs that require quick attention,” said Ben Farrell, owner of Precision Plumbing and Earthworks. Running water, flushing toilets and hot water are more than just modern conveniences – they’re necessities. Modern plumbing systems are complex arrangements that can break down and cease to function for any number of reasons. Diamond Valley emergency service is available to address a wide range of needs and is available at the first sign of a breakdown. Before a minor inconvenience turns into a major malfunction, there are signs that consumers may notice that indicate an impending problem. Drains in sinks, showers and bathtubs that take longer than usual to evacuate water can be addressed before they stop working entirely and create a backup or overflow. Water pressure that has a reduced stream may be an indication of a defective faucet, a tap that needs to be replaced, or a pipe that’s leaky, broken or partially frozen. While pipe problem can occur anytime, winter places special stresses on systems. Multiple types of water heaters are also serviced, including gas, electric, solar and instantaneous models. A toilet that won’t flush is particularly vexing and requires the immediate services of an emergency plumber to prevent an overflow. The underlying difficulty could be a clog resulting from a myriad of causes. Toilets that run without filling the cistern are also within the expertise of an emergency plumber. Sometimes a drainage problem is the result of difficulties with underground pipes, a situation that Precision Plumbing professionals are well qualified to handle. The use of high pressure equipment and advanced technology that includes CCTVs enables the plumbing experts to locate and identify the problems quickly. Exact excavations can be performed to address pipes that have become cracked, broken or dislodged. The Diamond Valley emergency plumber services provided by Precision Plumbing & Earthworks ensure a prompt resolution for problems ranging from clogged drains and broken pipes to dysfunctional water heaters. The company provides free disposal of defective water heaters, repairs and replaces taps, and offers repair, maintenance and replacement of roofs. 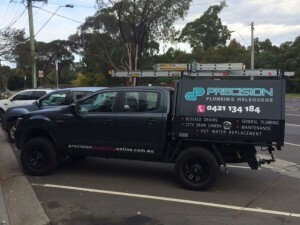 Precision Plumbing provides 24/7 emergency and general plumbing services for clients within the Diamond Valley across Melbourne’s north eastern suburbs.